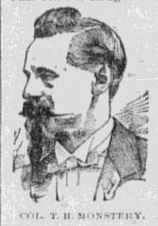 The following article appeared in the February 17, 1883 issue of the Chicago Daily News, and contains an interview with the celebrated duelist, swordsman, boxer, and master of arms, Colonel Thomas Hoyer Monstery. 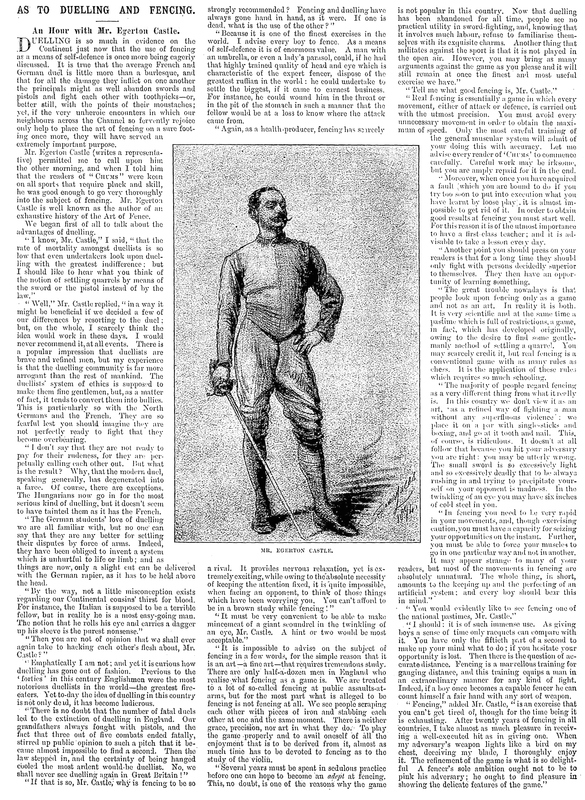 It appeared in print very shortly after Monstery’s arrival in Chicago from New York, and appears to be the first profile of the fencing master written and published in the Windy City. The interview is especially interesting, as it provides a great deal of information about Monstery’s weapons, training equipment, and students (both male and female). Here follows the article in full, supplemented by related historical images, and a few newly inserted footnotes. 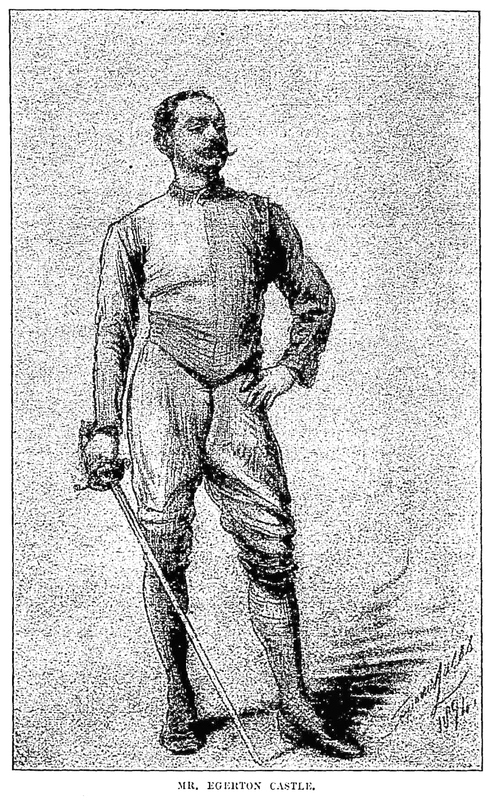 Fencers and Fencing in Chicago—An Old Master’s Choice Weapons—Thorne and Mayo as Dagger-Duellists—Experts with the Rapier. “On guard, if you please; now parry this,” followed by the whistling of foils and sounds such as emanate from a room wherein fencing is being practiced, were what one entering a certain room on Randolph street might hear any afternoon. The words were spoken by Col. Monstery, the swordsman, to a young athlete whose tutor he was. The colonel was instructor in his art in leading military schools in Europe, and under his training a hundred duels have been fought. He is a soldier in appearance, and stands erect five feet and ten inches. He is spare in his physique, but his frame is of iron and full of suppleness. His hair is gray, and his fast whitening mustache and imperial are waxed after the manner of Napoleon. His eyes are as bright and sharp as those of a man of twenty-four years, and his very carriage shows that age has not detracted from the grace and agility which marks the perfect master of the sword. The colonel was born in 1821, in Baltimore, Md., of Scandinavian parentage¹. He early went to Denmark, where he was for a number of years pupil in the Royal military academy, in which school he afterward became an instructor in fencing. His life has been a varied one, and yet, in spite of all his hardships, he is as cheery as a youth. For many years he has taught fencing in all the large cities of Europe, where his name is remembered with pleasure by swordsmen. Among his noted pupils was the Grand Duke Constantine. In 1868 he followed Maximilian to Mexico, where he was made instructor in swordsmanship to the Mexican army. He served through the war of that time and became noted by his wonderful proficiency with every style of weapon. The room in which the old master swordsman stood was a curiosity. On one wall was a large rack in which were some thirty foils, of all styles of make and quality. Just below these were boxing gloves, and guards for the fencer’s hands. Above the rack was a magnificent Toledo blade which, the colonel said, was his favorite, and was 500 years old. Crossed with that was a Swedish sword, whose perfect steel could not be equaled in America. Next to this pair of matchless weapons was an English army sabre, crossed with a Danish “iron-cutter,” and hanging beside these were two other swords. On the colonel’s desk were two daggers, one a genuine Roman weapon, the other a curious antique knife, which was a masterpiece of workmanship, evidently produced by a rival of famed Damascus. Near these were dueling pistols and revolvers, with the use of which the colonel was perfectly acquainted. On the front wall between two windows hung a breastplate of steel, found in Central America, and undoubtedly worn by one of the Spaniards who first invaded that land. Near this were found rules for fencing and boxing², originated by the professor and adopted as the standards. There was another breastplate of steel, heavily gilded, but battered and marked by constant use. 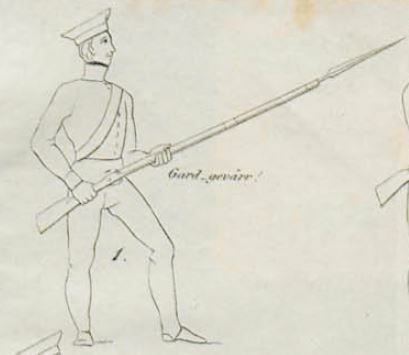 Bayonet guard (1838) in the system of Pehr Henrik Ling, which method Monstery learned, among others. On the third wall was a motley and interesting collection of wire masks of all varieties. 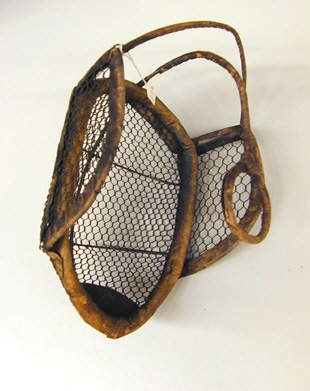 Fäktmask, or fencing mask, from the Livrustkammaren in Stockholm, Sweden. Florett, or foil, with an unusually broad blade, from the Livrustkammaren in Stockholm (it is not known how similar this may be to the foils Monstery describes). “With the broadsword the Americans and the Germans. With the rapier and the foils, I think the Americans can again take the palm. The most celebrated French swordsmen were with Maximilian when he went to Mexico, and I know that out of over two hundred duels that were fought there, the Mexicans won two-thirds. They are beautiful swordsman. He keeps his skill well, for he teaches fencing, and he keeps in practice. If more Americans would take fencing, they would be the best in that, as they are in everything. Mind, I don’t want them to fight duels. That is not what the noble exercise is for. It is to make them graceful, and bright, and quick. Monstery’s pupil with the Bowie Knife: actor Charles Thorne. 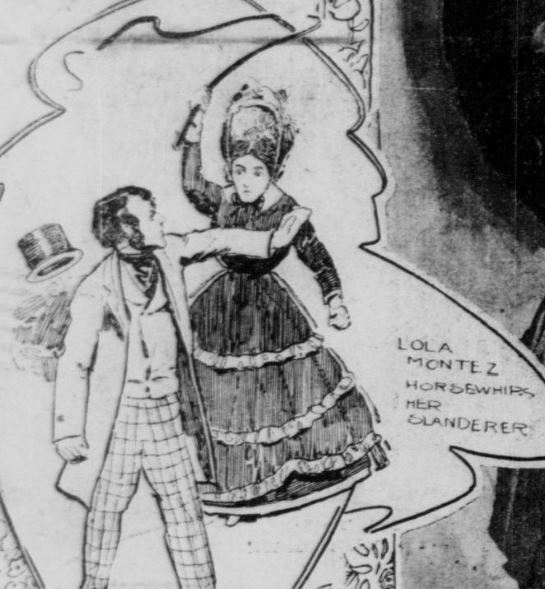 The dagger fight prepared by Monstery: from the Daily Alta California, May 14, 1870. ¹ This statement is erroneous. Birth records show that Monstery was born in 1824 in Copenhagen, Denmark. ² These rules have been reprinted in full in the Appendix of Monstery’s Self Defense for Gentlemen and Ladies. ³ An account of this duel, between Col. Canzi and General Fardella, and of Monstery’s training of the former, can be found in the Introduction to Self Defense for Gentlemen and Ladies. Smallsword defense against Broadsword, from Angelo’s plates from L’Ecole des Armes included in “Escrime,” Encyclopédie (Paris, 1765). Today, it is not uncommon to witness or overhear martial arts enthusiasts arguing over the merits of various weapons and respective martial arts methods, and their supposed superiority (or inferiority) over others. Such a discussion, it turns out–in the form of a public controversy–also took place in early nineteenth century Boston, at a time when the world of American journalism was quickly expanding, making public arguments even more possible–and likely to occur–than ever before. At the center of the incident was one Robert Hewes (1751-1830), a Boston native, local eccentric, and fencing master. 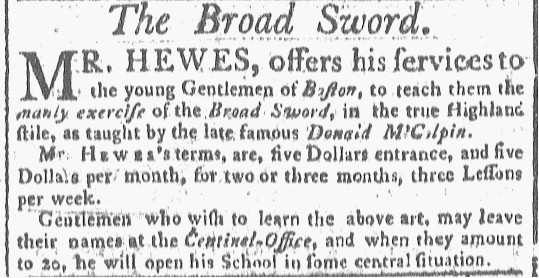 Described by his contemporaries as an “extraordinary” and “ingenious” man, Hewes was a former member of the secret revolutionary society, the Sons of Liberty, and the first American fencing instructor that we know of to publicly advertise instruction in cane defense. He was described by the Boston press as a surgeon, as well as a “celebrated bone-setter and fencing master.” In acknowledgement of this fact, Hewes hung a sign outside his residence which humorously read, “Bone breaker and bone-setter.” According to Hewes himself, his training in fencing began about 1770, at which time he entered the school of the Scottish Highlander, Donald McAlpine. 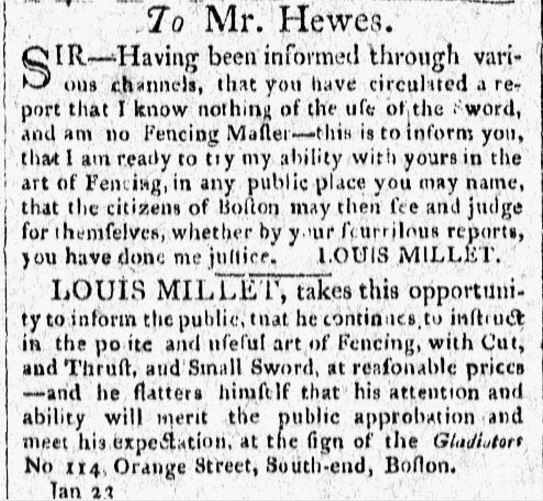 Evidently, Louis Millet had recently arrived in Boston, for very the same day he posted his challenge to Hewes, he also published (in the same issue) his first fencing advertisement in the city, informing the public that he offered instruction in the “polite and useful art of Fencing, with Cut, and Thrust, and Small Sword, at reasonable prices.” Millet was also associated with a group of French instructors, including Messrs. Tromelle and Girard, at the military fencing school of Colonel Amelot De La Croix, also in the Boston area (Independent Chronicle, March 20, 1809). SIR—In last Saturday’s Centinel, you charge me with saying, that you know nothing of Fencing, &c—and invite me to a public trial of skill, &c—As to the scurrilous charge of my saying that you know nothing of the use of the Sword, I can in conscience deny it:—But, what I have said, and do now say, is this—That I believe you understand the Small Sword very well; but that you do not so well understand the Broad Sword;—so think some of your friends. Mr. MILLET, you must give me leave to presume, that I do understand what the Broad Sword is scientifically; having learnt it of the famous DONALD Mc GILPIN, a Scotch Highlander, above thirty eight years ago; and I have had the honor and pleasure of teaching it to many of the Officers of our Revolutionary Army, in Roxbury and Cambridge, in the year 1775—and have done it at times, ever since. During the last ten years I have kept a regular school. But the Broad Sword you understand, is the French Counterpoint—a great difference. I then presented you with one broad sword Foil; I having the other myself. My two pupils paid strict attention to everything we did; but your friend, Mr. P———, seemed to be regardless of what was going on, for he sat all the time eating nuts as hearty as a grey squirrel. Now comes the technical description of the combat:—First, we join issue upon an inside guard—I cut you with cut two, on the outside of your arm:—you then come to the counterpoint guard in seconde—I cut you four, under your arm;—we join again and I cut your leg with cut six;—the next was a counter. An image showing the numbered cuts from the treatise of Col. Le Marchant, which was edited and republished by Hewes in America. I then said, “Come, Mr. MILLET, attack me in your turn, and do it well, or I shall catch you.” You then made a little movement and hit my arm. You then came in a very swordsman like manner, and made cut five, at my body—I spring back, slipped your cut, and gave you a plump cut upon the head—and so the combat finished, by my cutting you four times, and you cutting me once. Now, Mr. MILLET, since you have treated me in this scurrilous manner, by denying the merits of our combat, which was solicited by yourself, and persisting in publishing your scurrilous piece; I am determined never to have another trial of skill with you, publick or private; nor to have any altercation or conversation with you, written or verbal; and if any thing more shall appear in the papers, I am determined not to take the least notice of it. To Young Gentlemen who intend to learn the Art of Defence on foot with the Broad Sword and Sabre or Cut and Thrust. IT always has been, and with some is still a disputed point which is best, the Broad Sword, or Small Sword.—Some will assert, (not knowing what the true Scotch Broad Sword is) that the Broad Sword is no manner of Defence against the Small Sword.—Others (who understand the Broad Sword well, and can play well, by daily experience) prove, that it is a complete Defence against the Small Sword, by evading or guarding their thrusts—and cutting their head or arm, which they generally do twice out of three:—the reason is, being too much practised in bending the elbow the Cuts of the Broad Sword meet their arm instantly;—as was verified the other day thus:—One of my Scholars introduced a French Gentleman and desired to play the Small Sword with him. We played loose pretty sharp a few moments, and neither hit.—He then desired us to play Cut and Thrust—we did;—but he no sooner moved than I cut his arm three times. He then says to my Scholar the reason Mr. HEWES cut my arm so easy is, because I am too much in the habit of playing the Small Sword with a crooked arm—therefore I cannot play Cut and Thrust. This Gentleman was candid enough to own, that the Cut and Thrust cannot be played with a crooked arm:—Therefore, to play true and with safety with a Cut and Thrust, the Broad Sword, according to the Scotch and Austrian systems, must be well learnt.—Which forbids the bending the elbow, raising or lowering the arm or passing the line to the right or left—in fine, the arms is as an iron bar, the wrist the pivot round which the Sabre flies, or in other words, the hand and hilt of the Sword is the centre of action, as a hob to a wheel; the blade as the spokes. Sign of the Gladiators, Ann Street, near the Draw Bridge, Boston—who has had the pleasure of teaching the Broad Sword near forty years. N.B.—The Horse and Train of Artillery Sabre Exercise—and Cane Fighting taught as heretofore. SOME Fencing Masters have read in the Columbian Centinel, the observations of a Mr. Robert Hewes, styled Primary Military School—setting forth the advantage of the Scotch Broad Sword—Experience having demonstrated to then, that the gentleman infallible to a mistake, without enlarging on the observations, which would demonstrate that even a slight wound on the arm would not prevent his antagonist from thrusting his sword through his body, and without remarking, that gentlemen in the habit of fencing with baskets, as it has been observed, would soon be disabled in the hand if armed with an ordinary Sabre—In order to prove in an undeniable manner, what they now assert—the Fencing Masters have the honor to invite Mr. Hewes, respectfully to attend the general assault—to be given on the 23d inst. at the Military School, Court-street, No. 17, where he may have his choice in any kind of fencing, or cane-fighting, on the true principles of the Paris Academy. They flatter themselves that Mr. Hewes will not fail to appear—his assertions render his presence indispensible, and the Spectators are entitled to a demonstration. 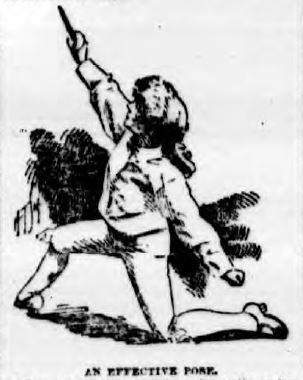 Hewes, however, true to his word, neglected to take this “bait,” although he remained an ever-present voice, and teacher, in the Boston fencing world until his death in 1830. In the end, Hewes merely defended his method as a “complete defence” against other weapons such as the small-sword, and did not necessarily assert its superiority over them. By contrast, Donald McBane–a Scottish swordsman regarded as one of the most prolific duelists of all time–wrote in his treatise that the small-sword had “great odds” over the broadsword, and over nearly all other weapons. If anything, the outcome of Hewes’s combat with Millet (if we are to believe the former’s account), attests to the usefulness (and during the period, the necessity) of a swordsman being familiar with both (or all) predominant methods and weapons in use at the time. Indeed, in considering the entire history of fencing, it is evident that the ultimate superiority lies in the fencer who wields the sword, not in the particular type of weapon wielded. 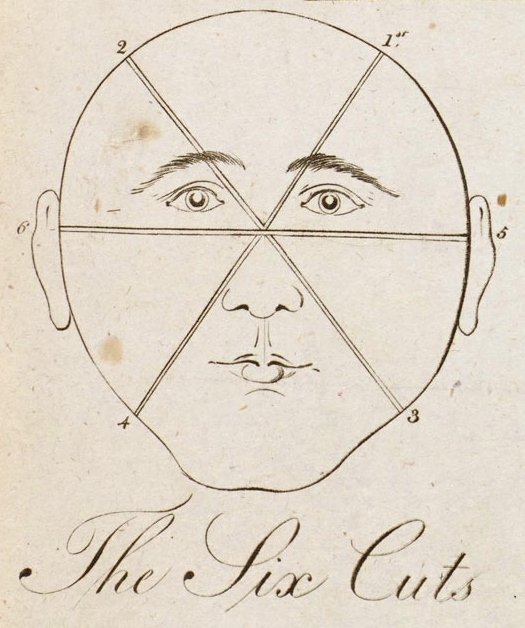 Boston Democrat, Jan. 13, 1808. Announcing the release of the book, Irish Swordsmanship: Fencing and Dueling in Eighteenth Century Ireland, available in October 2017. The product of more than ten years of research, the first part of this book tells the story of eighteenth century Ireland’s most renowned duelists, gladiators, and fencing masters, as well as that of Ireland’s most celebrated fencing society, the Knights of Tara—whose lavish fencing exhibitions won fame and glory for Ireland, and whose member’s innovative writings on bayonet fencing found their way into the hands of George Washington. In 1870, one of America’s most distinguished martial arts masters opened a “School of Arms” in New York City. He was a fencing master, boxer, marksman, sailor, adventurer, street fighter, soldier of fortune, and world traveler. He was Colonel Thomas Hoyer Monstery. When it came to combat, Monstery had an impressive resume. He had fought under twelve flags in numerous wars and revolutions, had survived participation in more than fifty duels with the sword, knife, and pistol, and had twenty-two scars on his body to prove it. 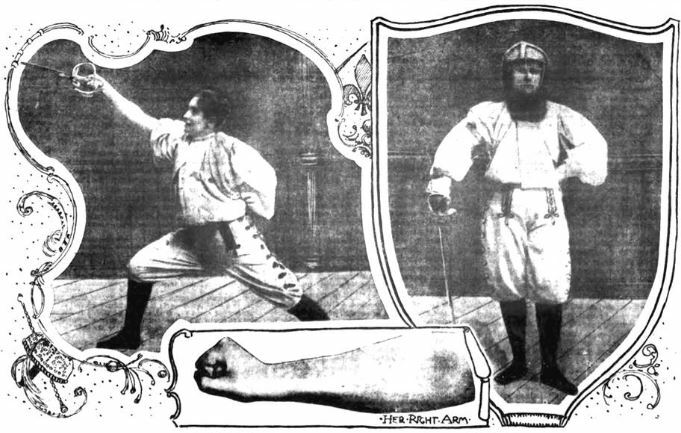 In addition to being a “master of all arms” (which included the rapier, dagger, broadsword, Bowie knife, lance, bayonet, and quarterstaff, among others), Monstery was also a “professor of sparring,” and taught a special system of bare-knuckle self-defense that integrated punching, grappling, and kicking techniques, designed to be effective against a wide range of fighting styles. Perhaps due to this progressive attitude, Monstery was able to attract a remarkable number of high-profile female students, some of whom led truly extraordinary lives. Following are their stories. 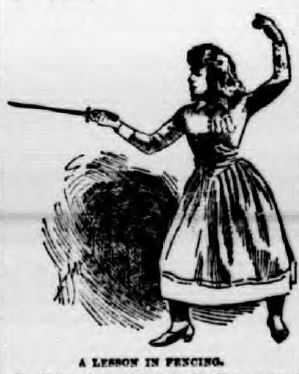 On the right, Ada Isaacs Menken poses with sword and shield for her role in the melodrama “Mazeppa.” According to the Daily Inter Ocean of Oct. 29, 1893, Colonel Monstery personally prepared Menken for this role; although she had only intended to learn fencing for this specific production, she afterwards became a regular student of Monstery’s. 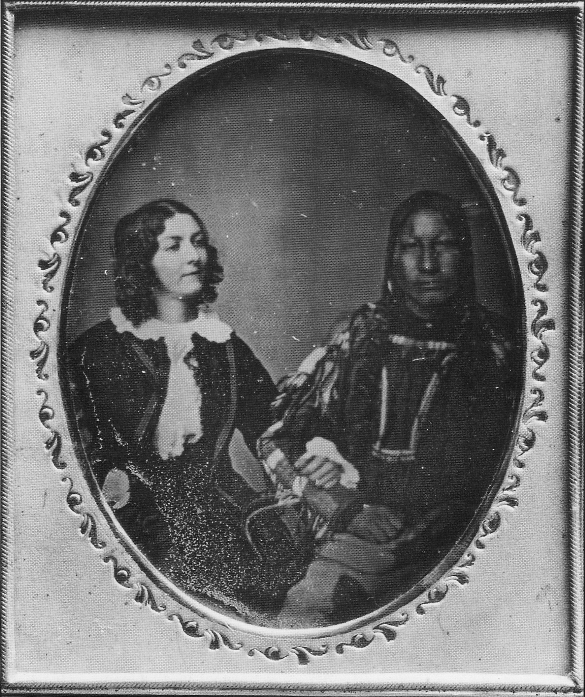 She died in the Jewish faith in Paris on August 10, 1868. On her deathbed, she talked of this world and the next with a rabbi she had befriended, and then wrote, “I am lost to art and life. Yet, when all is said and done, have I not at my age tasted more of life than most women who live to be a hundred? It is fair, then, that I should go where old people go.” She was buried in Montparnasse cemetery. On her tomb, at her request, were engraved the words ‘Thou Knowest’. More about Menken’s amazing life and career can be read about here and here. 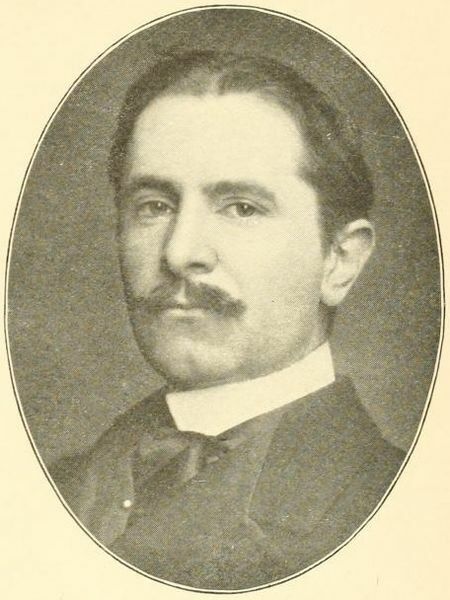 Jansen was born in Boston in 1857. 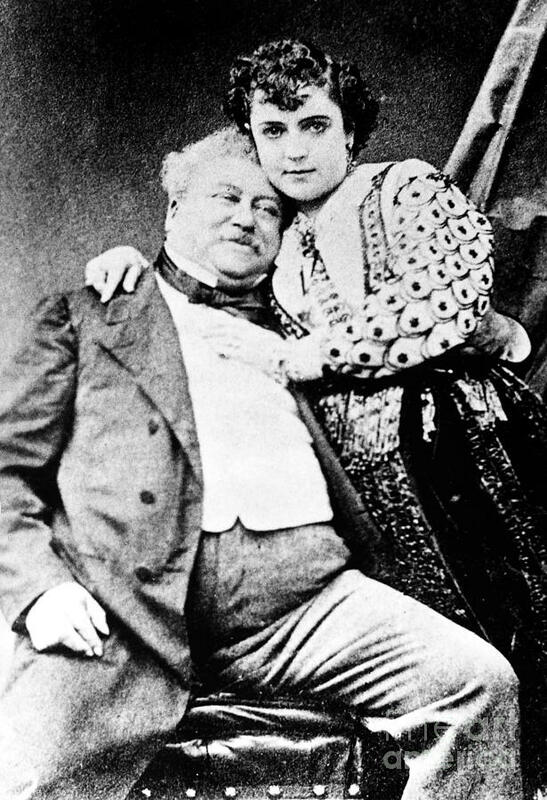 She would go on to star in a number of successful comic operas, Edwardian musical comedies, and comic plays in New York, Boston, Philadelphia and London during the 1880s and 1890s. 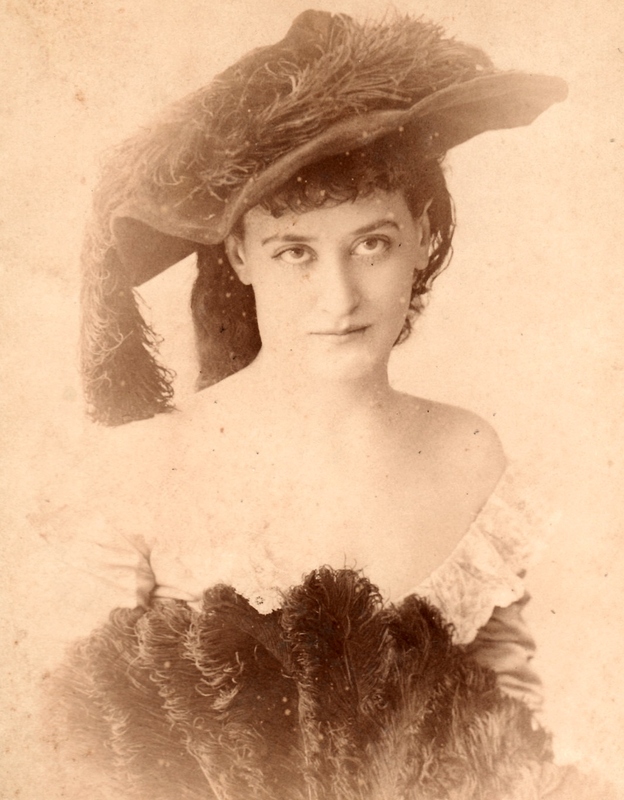 Later in her career, she performed in vaudeville and formed her own touring theatre company. More about Jansen’s life can be read about here. 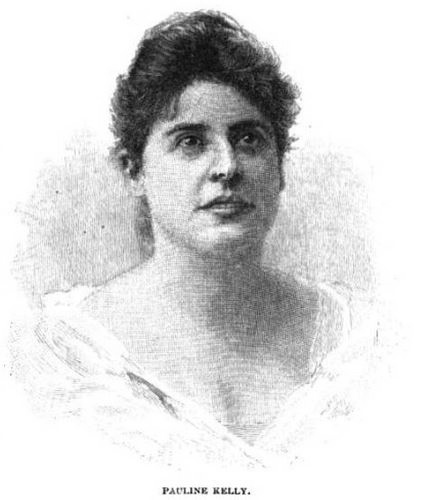 Ella Hattan, better known by her nom-de-guerre “Jaguarina,” was Colonel Thomas Monstery’s most accomplished student. 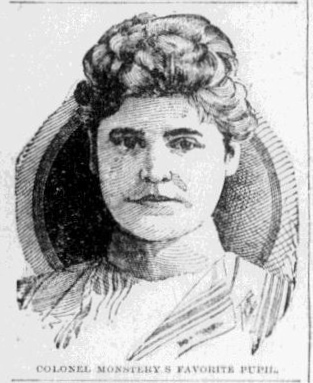 Born in 1859 in Ohio, she would go on to become widely regarded as one of the greatest swordswomen of the nineteenth century, and perhaps of all time. For more details of Hattan’s extraordinary career, her training, and her lengthy master-student relationship with Monstery, see this article. 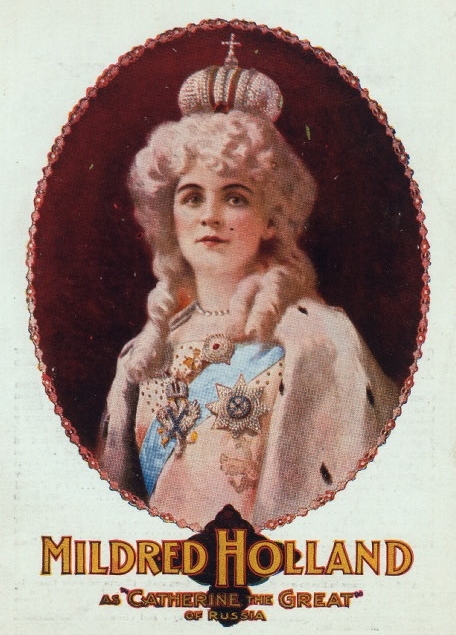 Mildred Holland is pictured here in her 1904 role as Catherine the Great. 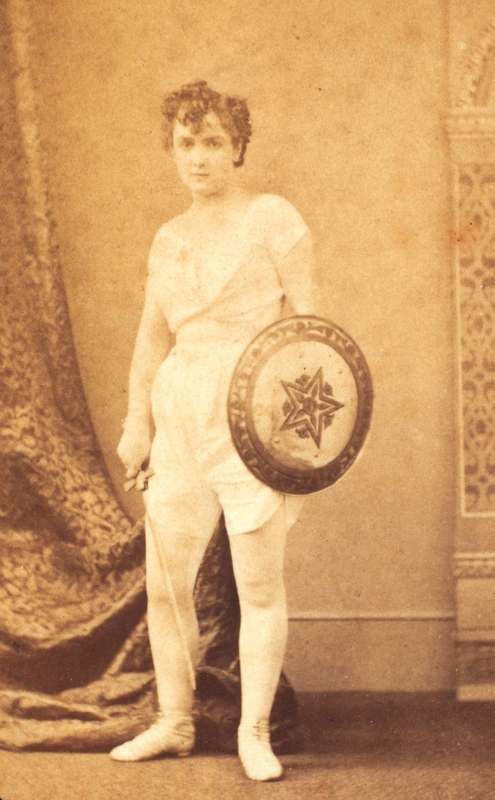 Next to Ella Hattan, Holland was one of Monstery’s best known students and a “champion” of many fencing contests. “Miss Holland is not a social star, but a hard-working student. Self-reliance, grit and confidence in her own capabilities are elements which have sustained the little lady in her ambition. She is not rich, and her tuition was secured by her well-saved earnings. Her pluck has been demonstrated by her wonderful dexterity with the foils. “In this accomplishment she is a pupil of Col. Monstery, is accounted one of the most expert swordswomen in the United States and is the possessor of two gold medals for efficiency, one of which was won two years ago at a contest and presented to the fair champion by Lieut. Gov. Smith. Holland makes a series of rapid, graceful attitudes. The little white wrist is as firm and flexible as steel, the ankle well turned and solid, and the head gracefully poised, She is quick in her motions, exhibiting litheness, grace and precision. Her recoveries are rapid, her eye true, and she enters into her work with striking coolness and nerve. Col. Monstery says she is a wonder and the Conservatory is proud of its champion, for, in addition to her trophies, she defeated by six points Miss Anna Schaffer, one of the professional Viennese swordswoman. Miss Holland is modest of her achievements. 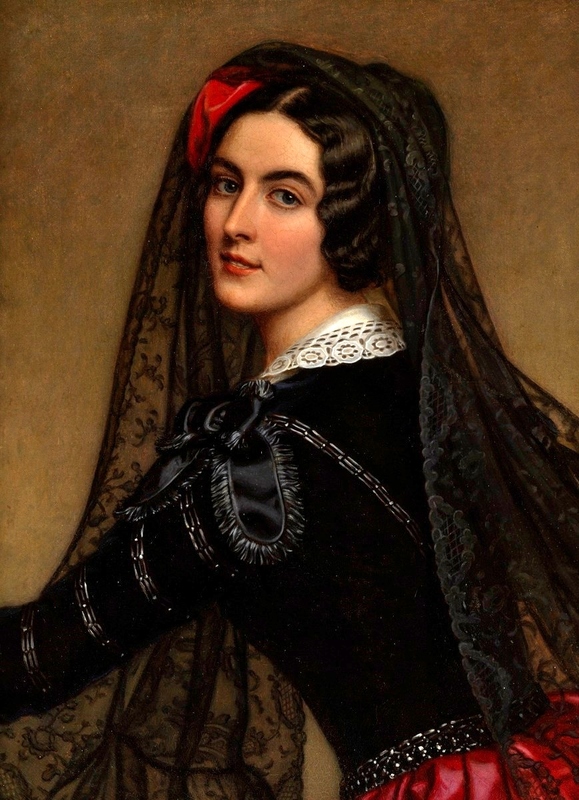 “Lola Montez,” in actuality Marie Dolores Eliza Rosanna Gilbert, Countess of Landsfeld, was an Irish dancer and actress (born in Limerick) who became famous as a “Spanish dancer,” courtesan, and actress. After performing in various European capitals, she settled in Paris, where she was accepted in the rather Bohemian literary society of the time. 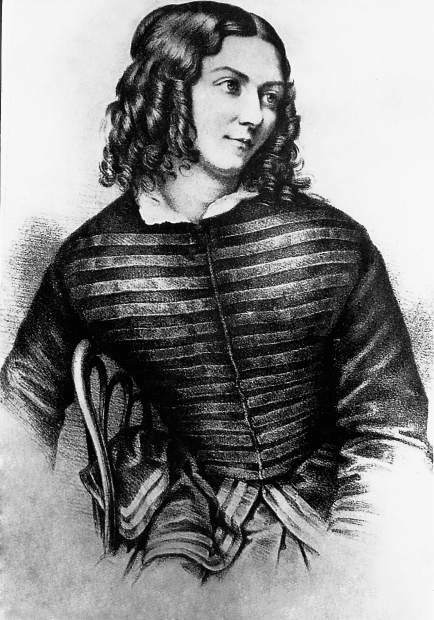 After the 1845 death of her lover, newspaperman Alexandre Dujarier, in a duel (unrelated to her), she left Paris, and became mistress of King Ludwig I of Bavaria, who made her Countess of Landsfeld. She used her influence to institute liberal reforms in Germany. At the start of the Revolutions of 1848 in the German states, she was forced to flee. She proceeded to the United States via Switzerland, France and London, returning to her work as an entertainer and lecturer. 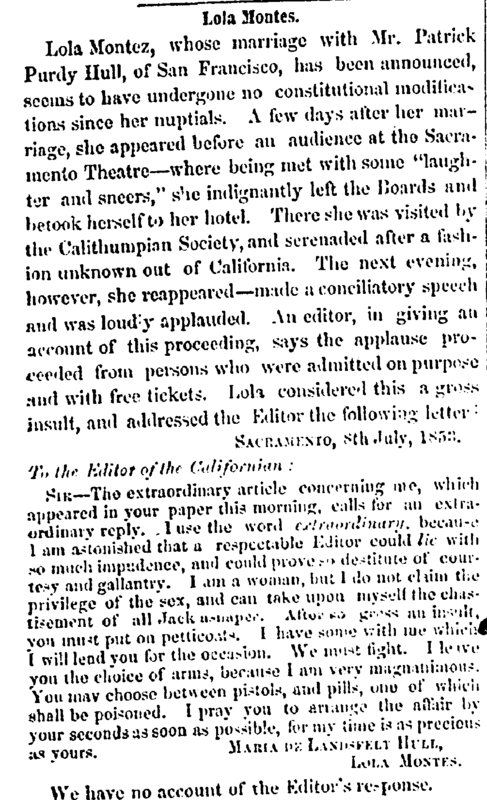 The article pictured here, with Lola’s challenge to duel in California, was published in the Richmond Whig of August 16, 1853. In 1860, it was reported, erroniously, that Lola was killed in a duel at San Juan de Niblo. With declining health, she finally moved to Brooklyn, New York, where she lived until her death. She spent her last days in rescue work among women. More about Montez’s extraordinary life can be read about here. 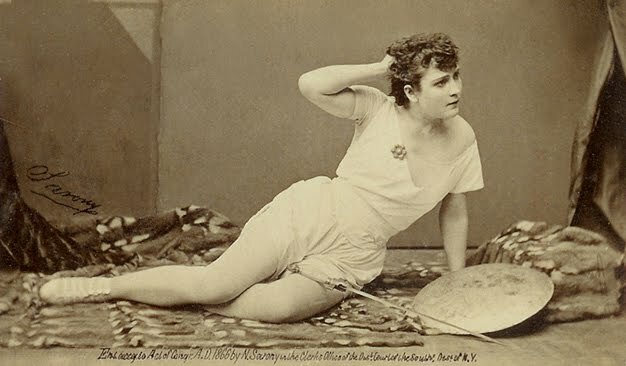 Born in Mississippi, Adele Belgarde (actual name Adelaide Levy) starred in a number of theatre productions in New York City during the late 1870s. She initially came to Monstery to learn fencing in order to prepare for her starring role in “Hamlet.” She would also star in “Romeo and Juliet” and would play Queen Elizabeth. 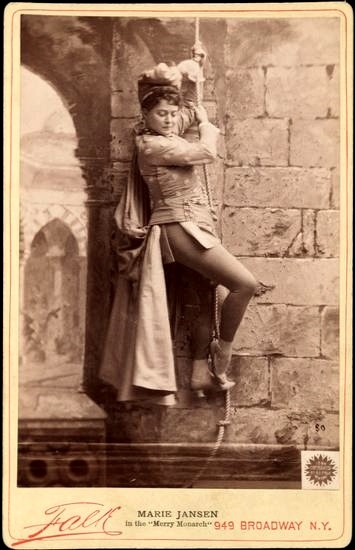 In 1895-1896, Belgarde toured with Thomas W. Keene, the famous Shakespearean tragedian, playing Lady Anne to his Richard III. She also played Marie to his Louis XI. She would go on to star in at least one silent film titled “Happiness” in 1910. She died in 1938 and is buried in Forest Lawn Memorial Park, Glendale, Los Angeles County, California. 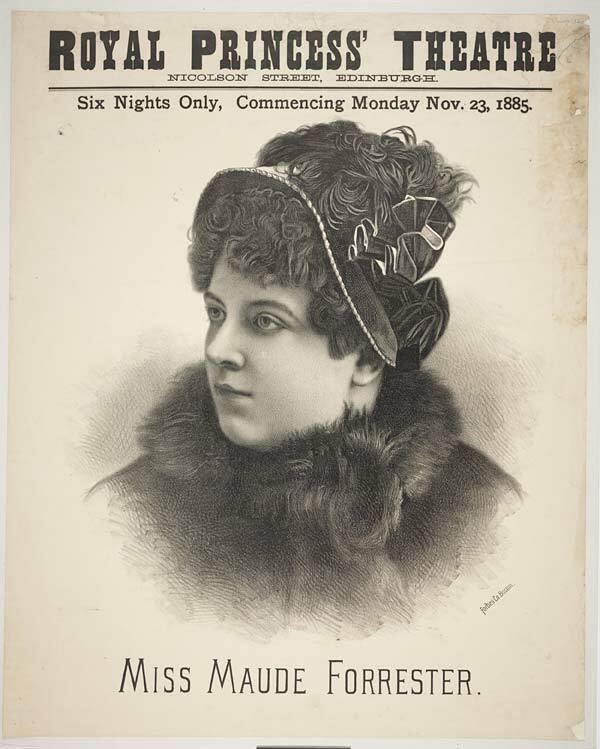 Maude Forrester was a lesser-known English actress who also, along with Ada Isaac Menkan, starred in “Mazeppa.” Under Monstery she became “quite proficient” in fencing. She was also billed as a “celebrated equestrian actress” who was known for her “matchless impersonation of Mazeppa! accompanied by [the] celebrated and highly trained steed, ‘Lightning’,” and was “universally recognised as Queen of the Amazons at the Alhambra before the advent of the colossal Marian of ‘the Praerafaellite maxillary angle’.” She also played the title role in Lady Godiva. 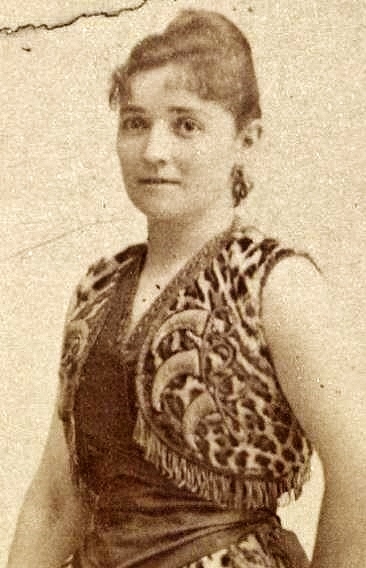 Miss Mabel Marsh learned fencing under Monstery at his Chicago salle d’armes on Randolph Street, where she often crossed blades with fellow actress and prodigy Mildred Holland. 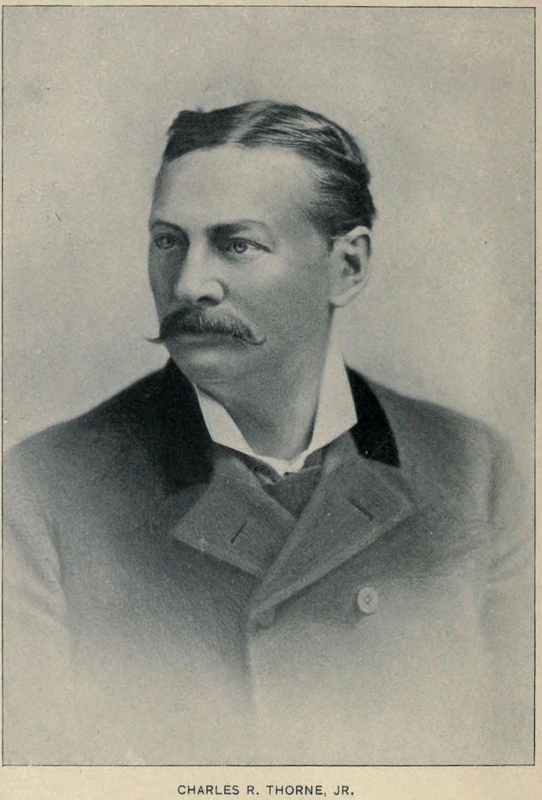 A detailed, firsthand account of Marsh’s training under Monstery can be found on pages 24-26 of the Introduction to “Self-Defense for Gentleman and Ladies” by Col. Thomas H. Monstery. These pages can be read in the free online preview of the book on its Amazon page. 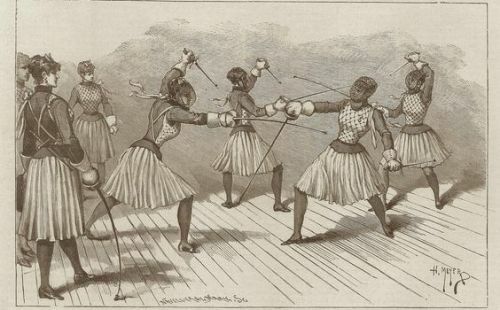 Colonel Thomas H. Monstery‘s martial wisdom survives in his treatise on Boxing, Kicking, Grappling, and Fencing with the Cane and Quarterstaff, which was recently published by North Atlantic Books in book form for the first time. This volume contains a new, detailed biography of Monstery, and includes additional writings by the Colonel. This article © 2015 by Ben Miller. This historically important film shows children demonstrating martial arts techniques on Mott Street in Chinatown, New York City, on or around January 29, 1930. This footage was recently discovered by Rodney Bennett of Anglesea, Australia. Egerton Castle (1858-1920) was a British swordsman and antiquarian, probably best-known for his reconstruction of historical fencing methods during the late nineteenth century. His 1885 book, Schools and Masters of Fence, from the Middle Ages to the Eighteenth Century, is still regarded as a standard reference on fencing history that has yet to be surpassed. A newly penned article about what classical fencing is and is not (as well as info regarding different styles of nineteenth century fencing), by Russell Hogg, instructor at the Cote du Golfe School of Fencing.